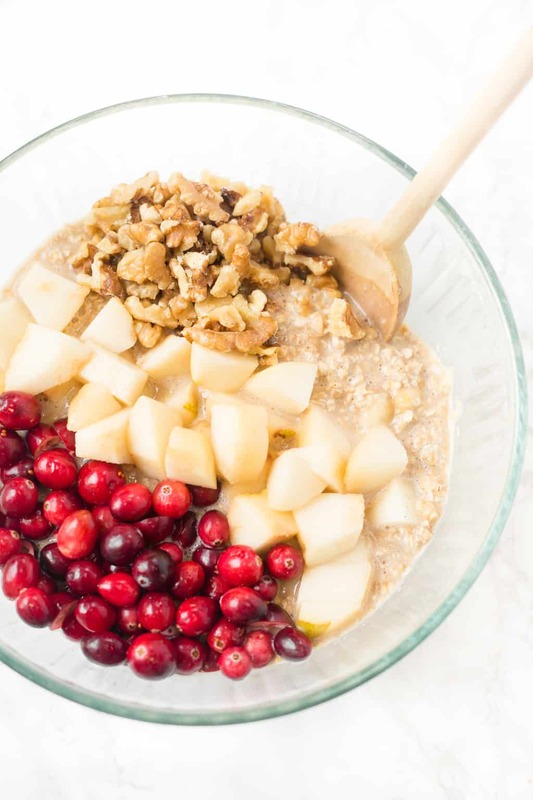 This cranberry pear walnut baked oatmeal is packed with natural sweetness AND tartness from the fresh cranberries and diced pears! It’s an easy breakfast that can be made in advance, and it’s also a hit with a crowd! Hope you all had a wonderful Christmas and that you’ll have a great New Year’s Eve! I spent Christmas at home in Raleigh with my 3 grandparents, brother, sister, brother-in-law, parents, and pup. We ate a lot of good food, went on lots of walks, and laid around a lot. Now, my grandparents have traveled back home and I have to head back to UNC in about a week, but until then, I’m enjoying my days of relaxing, spending time with the rest of my family, finishing up some law school applications, and COOKING. This may look like a holiday recipe (and I think it’d be perfect for Thanksgiving or Christmas morning! ), but I’m looking forward to having it all winter long. It’s perfectly cozy for the cold weather we’ve been having! Baked oatmeal has become a staple for me this year. It reminds me of a healthy fruit cobbler, and I make a batch almost every week. I actually eat it most often for snacks and dessert, but also sometimes for breakfast, too. Baked oatmeal is one of my very favorite things I’ve posted on the blog– it’s almost like a delicious cake packed with fruit– not to be confused with fruitcake 😉 – that happens to be healthy, too. 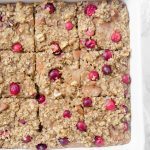 I’ve adapted my favorite banana blueberry version to come up with this cranberry pear walnut baked oatmeal. 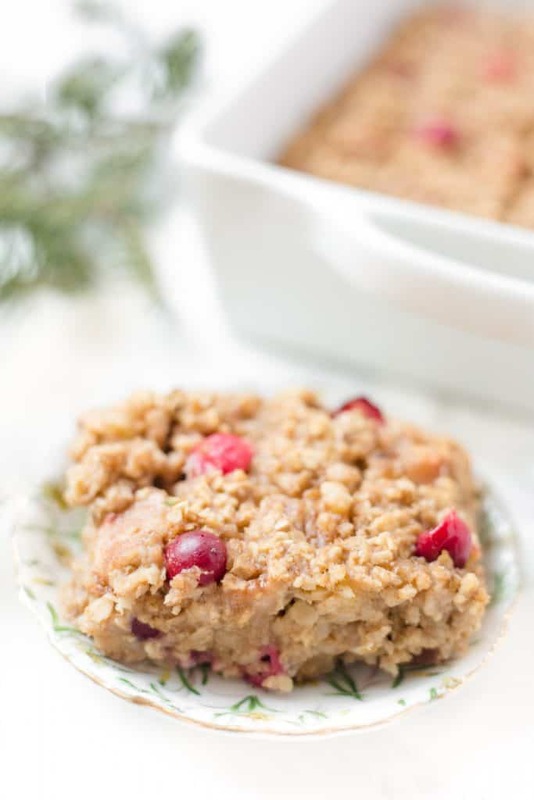 I saw a recipe for a cranberry pear crisp and immediately thought that combination would be fab in a baked oatmeal….and it was! The whole family loved it. We had leftover cranberries from the holidays, and I had a TON of pears in the fridge due to my grandpa’s surprise gift, so it was really convenient to make this time, but it’ll definitely be a repeat recipe even if I have to hunt down some cranberries and pears. The fresh cranberries are gorgeous and tart, the pears are a sweet contrast, and the walnuts add some nice crunch. Due to the natural sweetness of the mashed banana, you barely need any sweetener– just about 1/4 cup honey in the entire recipe. I think this recipe is the perfect baked oatmeal base and it’s very open to adaptations. 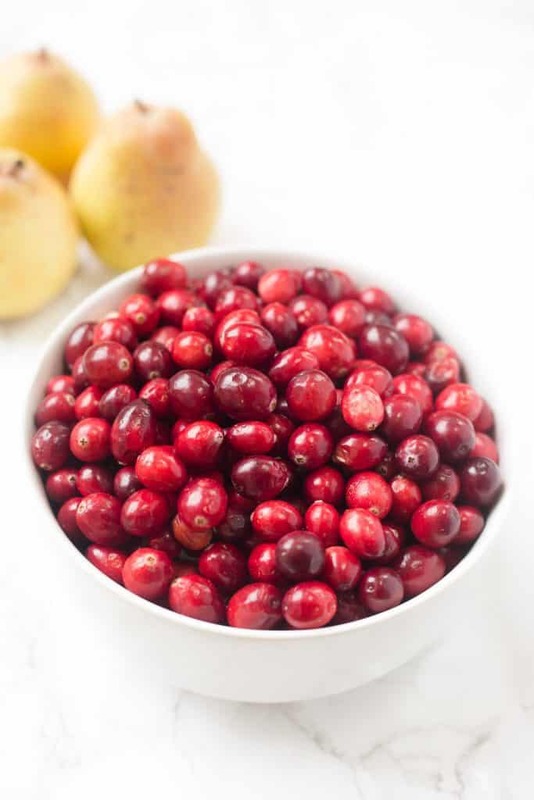 You could swap in 1/2 cup of dried cranberries or raisins for the fresh cranberries, use cubed apples instead of pears, or swap out the walnuts for chopped almonds or pecans. Lots of possibilities! I prefer my baked oatmeal a tad under-baked rather than over-baked, just like the best cookies and brownies. The outside pieces are perfectly set without being dry at all, while the center pieces end up being just a little gooey. I’ll take all of the gooey center pieces, please! One more thing: I love to double my baked oatmeal recipe and make it in a 13×9 inch baking dish and increase the baking time to about 45 minutes. Then, I just tent the baking dish with foil after about 30 minutes to keep it from getting too brown on top. 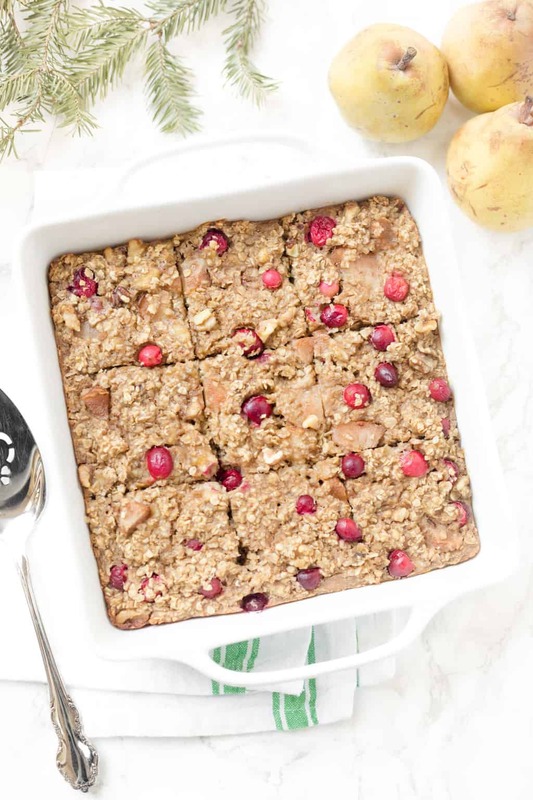 If you try out this cranberry pear walnut baked oatmeal recipe, feel free to let me know in a comment or take a picture and tag me @livbane on Instagram. Hope you enjoy! 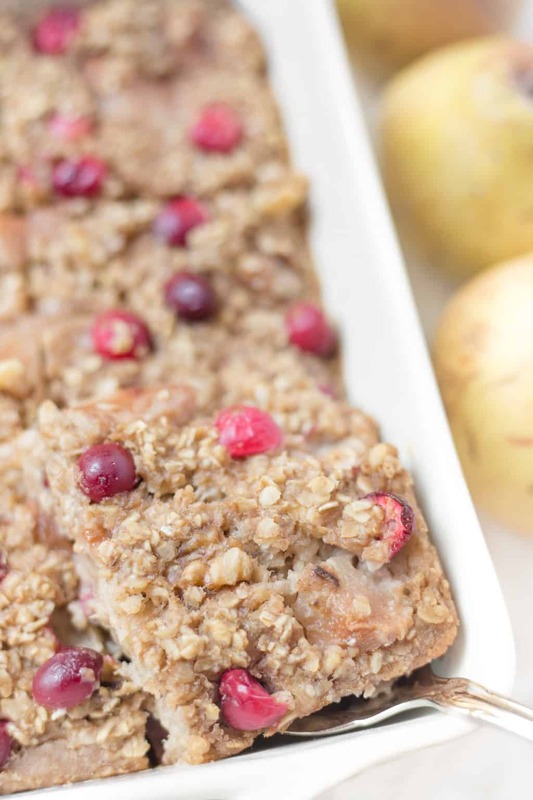 This cranberry pear walnut baked oatmeal is packed with natural sweetness AND tartness from the fresh cranberries and diced pears! It's an easy breakfast that can be made in advance, and it's also a hit with a crowd! In a medium bowl, mix together the oats, baking powder, cinnamon, and salt. In a large measuring cup, whisk together the milk, honey, eggs, and vanilla. Add liquid mixture to dry mixture in the bowl and stir to just combine, then add mashed banana. Drizzle in butter or coconut oil while stirring, then add cranberries, diced pear, and nuts. Grease an 8x8 or 9x9 baking dish with butter or cooking spray. Pour oat mixture into pan and bake for 25-28 minutes, until the the baked oatmeal is set and a toothpick inserted in the center comes out mostly clean. Let cool for 10 minutes in the pan and then serve, or refrigerate in a storage container for up to 5 days, reheating in microwave before serving. Looking for other baked oatmeal recipes? Check out my pumpkin pecan baked oatmeal, too! I’ve been looking for something like this to start the New Year with. Thank you so much! This is just perfect! Thanks, Kristen!! It’s fun to hear that we’re practically neighbors! I am planning big again to for my breakfast habbit for the coming months. Your baked oatmeal with cranberry would be a great addition! I sure do miss all your delicious meals. This cranberry/pear oatmeal sounds like a healthy snack. We will try making it. We miss having you here and I loved getting to cook for you over Christmas break! I love baked oatmeal and can just imagine the deliciousness of the flavor combination you have here! Such a lovely way to use cranberries!! Thanks, Elaine! Baked oatmeal is surprisingly SO good! Nothing like baked oatmeal – this combo sounds fabulous! I’ll have to leave the walnuts out due to allergies, but I bet it will still be good! Yes!! The red and green combo is so festive for the holidays, too. It’ll be great without walnuts, too. I’ve made the banana blueberry version no less than 10 times and I’ve forgotten to add the nuts (it’s the last step) probably half of the time. Still fab! Oh I love that combination!! Cranberry walnuts and oatmeal. I use it in my breakfast porridge oats in the morning. So I know that will work. Baked oatmeal is so underrated! Agreed! Until a year or two ago, it never even sounded appealing but once I gave it a try, I was hooked! This looks so so good! Baked oatmeal is forever my favourite breakfast! Same here! I made another batch this afternoon for the week ahead ???? Yes, add the mashed bananas with the wet ingredients. I’ll update the recipe. Thanks, Ronda! Hey Liv, Today, I was make this baked oatmeal and it was delicious! I love your blog. You did great work dear i am new and learning a lot thing from your articles, I am growing as a cook.